"docx4j is a Java library for creating and manipulating Microsoft Open XML (Word docx, Powerpoint pptx, and Excel xlsx) files. It is similar to Microsoft's OpenXML SDK, but for Java. " The general approach here is to first create a Word document that contains the layout and main styles of your final document. In this document you'll need to add placeholders (simple strings) that we'll use to search for and replace with real content. This will return a java object representing the complete (at this moment) empty document. We can now use the Docx4J API to add, delete and modify content in this word document. Docx4J has a number of helper classes you can use to traverse through this document. I did write a couple of helpers myself though that make it really easy to find the specific placeholders and replace them with the real content. Lets look at one of them. This operation is a wrapper around a couple of JAXB operations that allows you to search through a specific element and all it's children for a certain class. You can for instance use this to get all the tables in the document, all the rows within a table and more like that. 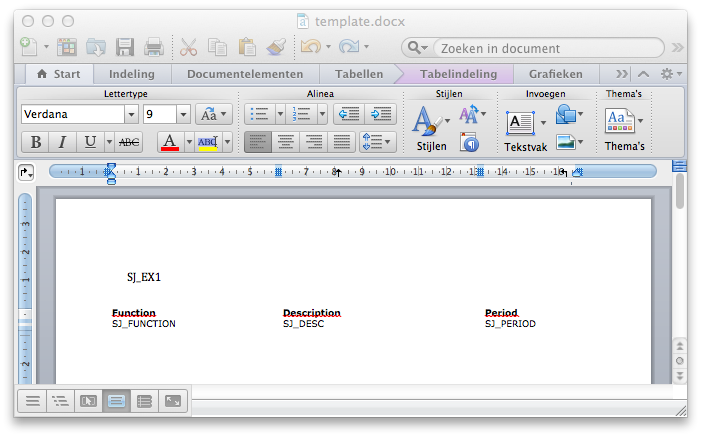 This will look for all the Text elements in the document, and those that match are replaced with the value we specify. Now all we need to do is write the document back to a file. Not that hard as you can see. With this setup we can also add more complex content to our word documents. The easiest way to determine how to add specific content is by looking at the XML source code of the word document. That'll tell you which wrappers are needed and how Word marshalls the XML. For the next example we'll look at how to add a complete paragraph. You might wonder why we need to be able to add paragraphs? We can already add text, and isn't a paragraph just a large piece of text? Well, yes and no. A paragraph indeed looks like a big piece of text, but what you need to take into account are the linebreaks. If you add a Text element, like we did earlier, and add linebreaks to the text, they won't show up. When you want linebreaks, you'll need to create a new paragraph. Luckily, though, this is also very easy to do with Docx4j. Shouldn't be to hard with the helper methods we already have. In this method we replace the content of a paragraph with the supplied text and then new paragraphs to the argument specified with addTo. If you run this with more content in your word template you'll notice that the paragraphs will appear at the bottom of your document. The reason is that the paragraphs are added back to the main document. If you want your paragraphs to be added at a specific place in your document (which is something you usually want) you can wrap them in a 1x1 borderless table. This table is than seen as the parent of the paragraph and new paragraphs can be added there. The same approach as we've also shown for the paragraphs. First though lets look at how we'll provide the replacement data. For this example I just supply a set of hashmaps that contain the name of the placeholder to replace and the value to replace it with. I also provide the replacement tokens that can be found in the table row. Now what does this replaceTable method look like. This function just looks whether a table contains one of our placeholders. If so that table is returned. The addRowToTable operation is also very simple. This method copies our template and replaces the placeholders in this template row with the provided values. This copy is added to the table. And that's it. 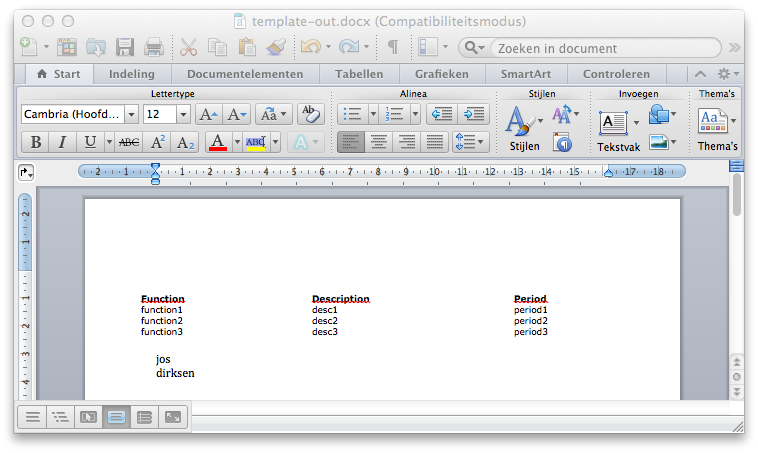 With this piece of code we can fill arbitrairy tables in our word document, while preserving table layout and styling. That's it so far for this article. With paragraphs and tables you can create many different types of documents and this nicely matches the type of documents that are most often generated. This same approach though can also be used to add other type of content to word documents.